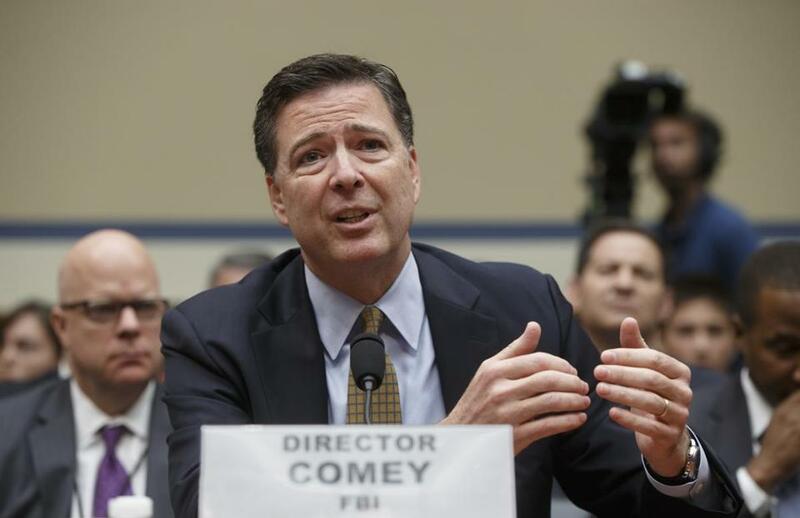 FBI Director James Comey testified on Capitol Hill in July. WASHINGTON — Hillary Clinton blamed the renewed FBI inquiry into her State Department e-mail system for blunting her momentum in the presidential election and the closure of that inquiry two days before Election Day for energizing voters for Donald Trump. ‘‘There are lots of reasons why an election like this is not successful,’’ Clinton told top donors on a farewell conference call Saturday. ‘‘But our analysis is that [FBI Director James B.] Comey’s letter raising doubts that were groundless, baseless, proven to be, stopped our momentum,’’ she said. ‘‘We dropped, and we had to keep really pushing ahead to regain our advantage — which going into the last weekend, we had. We were once again up in all but two of the battleground states, and we were up considerably in some that we ended up losing. And we were feeling like we had put it back together,’’ she continued. The surprise announcement of a revival of the shuttered FBI inquiry came at a time when the campaign was riding high, Clinton said. ‘‘After the third debate, we felt so good about where we were,’’ she said. Trump’s performance in the Oct. 19 debate was widely panned, especially his refusal to say that he would respect the outcome of the election if he lost. Democrats called him a sore loser. ‘‘We were up considerably in all but two of the battleground states where we were tied or one behind, according to our data,’’ Clinton said. ‘‘We were tied in Arizona. We just had a real wind at our back,’’ before the first, stunning letter from Comey. Clinton’s campaign insisted the reopened inquiry would turn up nothing, and many Democrats accused Comey of partisan motives. He was once a registered Republican. Clinton did not make that accusation Saturday. But Clinton did say that what should have been good news essentially backfired. Comey on Sunday issued another letter to Congress, concluding that the nine-day examination of newly discovered emails had turned up nothing to change his earlier conclusion that there had been no criminal conduct. ‘‘Just as we were back up on the upward trajectory, the second letter from Comey essentially doing what we knew it would — saying there was no there there — was a real motivator for Trump’s voters,’’ Clinton said. A day earlier, Clinton communications director Jennifer Palmieri had told the same group of donors something similar — that the news angered Trump voters and caused a spike in turnout, while Clinton’s projected turnout fell. ‘‘Trump spent the last four days of this campaign engaged in a nonstop attack on me personally, and the result is the result,’’ Clinton said. The Democrat focused on the outside events she said affected her campaign in the last three weeks of the election. She said nothing about other, larger forces at work — Trump’s message of change in a restive time, his pledge to represent the aggrieved working class, the difficulty of any political party winning a third consecutive presidential term, her own limited attention to economic anxiety or the sexism and discomfort that surrounded her attempt to become the first female president. Palmieri had pointed blame at much of that one day earlier. Neither she nor Clinton herself addressed the fact that Clinton’s decision seven years ago to use a private system for her government communication had opened the door to the FBI inquiry in the midst of her second run for the White House. Clinton has said the decision was a mistake.